When I started eating a plant based diet it was important to be satisfied with my food. I could not eat this way and feel hungry all the time. I also don’t like bland food so I decided to make hearty and spicy dishes. I’m not the kind of girl who can eat a salad everyday for lunch. Typically I’ll have maybe one or two salads a week, in the summer when it is too hot to cook here in Arizona I eat more salads. So if you a beginning to eat a plant based diet and you’re starving all the time you are doing it wrong. Eat more and eat more often. I often eat toast or a smoothie for a snack between meals. If you can chomp on baby carrots mid afternoon and be satisfied God bless you, but for the rest of us eat something else. Tomorrow I’ll share a yummy vegan muffin recipe that makes a great snack. Smoothies are make a great breakfast, they are easy, fast, and portable. Smoothies can be made with whatever you have on hand. No one in my house will refuse a smoothie. Blend flax seeds in a blender. Add everything else and blend until smooth adding more liquid if necessary. Serve this in a tall glass or insulated cup if your on the go. My smoothie made about 30 ounces so you can adjust the recipe accordingly. When I have fresh fruit I use it instead of frozen but this time of year frozen is typically priced much better than fresh. I buy big bags of frozen berries at Costco. When strawberries and blueberries are in season I buy a lot and stock my freezer. Mango, pineapple and raspberries also make delicious smoothies. When I have orange juice I’ll add it instead of milk. Smoothies can hide veggies as well. The spinach in this smoothie is undetectable. Try adding kale, parsley, or chard instead. I love a big baked potato. You may need to retrain your taste buds to enjoy a baked potato without butter, bacon, and sour cream. Before removing dairy from my diet I didn’t realize that I could enjoy a potato without it. Earth Balance Spread is a great transition food that will help with that dairy addiction, they also have a soy free variety. Earth Balance tastes and looks like butter. You can substitute it for butter in any recipe as well. Aside from Earth Balance Spread other toppings include steamed veggies like broccoli, vegan chili, salsa, nutritional yeast, and soups. Yesterday my husband had a baked potato for lunch topped with leftover Potato and Broccoli Soup. He said it was great and wanted to have it again next week. I just mentioned that Chili makes a great topping on a baked potato but it also taste great on it own. There are several vegan and vegetarian chili’s on the market but it is really easy to make it on your own. This never tastes exactly the same because it varies based on what ingredients I have and and how hot the pepper are. This chili is great on a cool day, it is hearty and filled with fiber. Cornbread or crackers make a great accompaniment. Chili also freezes well so make a big batch and save some for a rainy day.This chili is on my stove right now, I used pinto beans, kidney beans, and black beans. Yum! I really love your blog! It’s very helpful to someone like me who is trying to get my feet wet with this new lifestyle. I can’t wait to make this chili! The potato topped with soup also sounds wonderful. I’m so thankful to be on this journey with people like you. You are a light in the dark. Thank you for sharing your knowledge. Thank you for your kind words Johnny! I also get a lot of encouragement from reading about like minded people who are on this journey too. We are definitely not alone in this. I love that we can learn from each other. Keep up the good work! By the way in the ingredient list you listed Peppers as papers. FYI. LOVE your blog. HAHA! Papers wouldn’t really add to the chili. Thank you! I fixed it. I’m sure you will find many more typo’s. I’m trying to get better at editing. Keep me posted on your progress! I'd love to hear how it goes. Glad I found you blog. 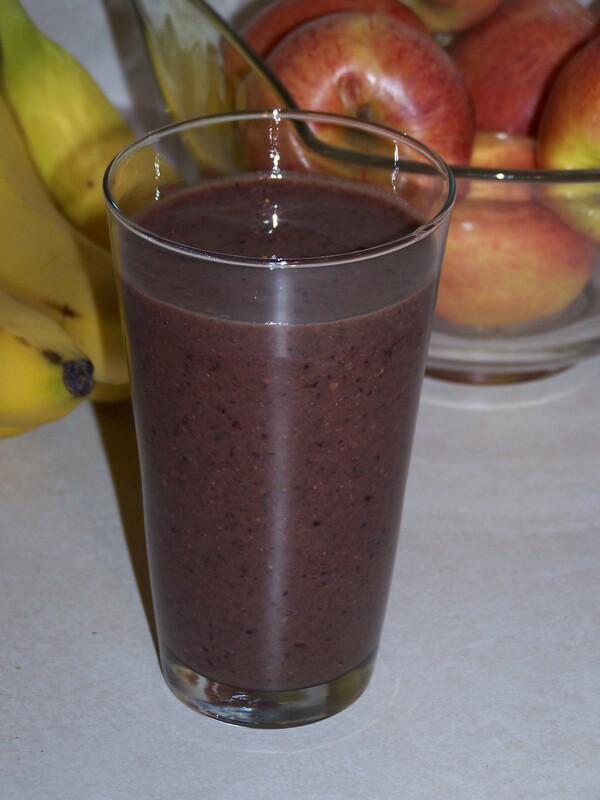 .In the smoothie, could you use flax meal instead of flax seed? I love making vegan chili and having it on oven baked fries. So amazing. P.S. I just found your blog and I am loving it. Holly, I am an old lady and I love your blog. I gave up meat about a year ago, and your recipes and meal plans make everything so easy. I am in awe of all that you do! Thank you, thank you. Wow, thank you so much! You are too kind! I have some great stuff planned this fall! I love your smoothie recipe. My 6 year old doesnt even realize shes consuming “yucky” spinach ?